You might not realize this, but Facebook is accessed monthly by 200 million users worldwide via mobile devices. This is quite unprecedented and it makes Facebook one of the most popular mobile applications in the world – regardless of what device is being measured. With single sign-on, app developers will now be able to integrate the Facebook graph into their apps by providing users with a single sign on button. 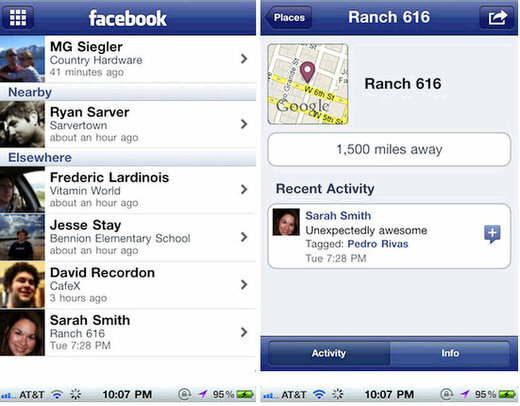 This is also another way for Facebook to be seemlessly integrated into mobile applications. No more users having to sign in with an email and password – now you will be able to simply tap the single sign on button and connect with the app via Facebook. One application I can this becoming a huge player in would be the iPad Facetime app (i.e. iPad video conference calls). Single sign on with Facebook integrated into Facebook on the iPad would allow easy conferencing set up, and easy options for users to join the conference via their iPad. With the new “location in the graph API”, you and your friends on Facebook will be able to connect more easily based on your location. Today, we’re making Places check-in and search functionality available to all Facebook Platform developers as part of the Graph API. Now you can access our database of Places and let users check in on Facebook from within your application. With access to information about millions of locations, any developer can bootstrap the development of a location-based app without having to worry about licensing location data or seeding friend activity for new users. You can also reach new users through distribution in News Feed, the “Friends Nearby” view in the Facebook app and other third-party apps that present friend check-ins.